At the beginning of the school year Peter Shaw from the Horticulture Department asked to meet with the CS/CIS faculty about using technology in their growing operations. The Horticulture Department has magnificent greenhouses and very high tech hydroponics. So how can digital technology enable agricultural technology? The challenge seems almost too perfect a fit for exploration of the Internet of Things. We decided to take an existing function and make it more user friendly. The greenhouse has a system that uses the daily light integral to determine how much to water. It's a simple system. Light is accumulated until the measurement reaches a threshold then the water is turned on for a time. So how could a system that has two parameters (threshold and duration) be unfriendly? When both parameters are set by DIP switch. Ouch! What networked gadget measures light? This device is designed to use solar power alone. Since it's measuring the sun it's safe to assume it will be put in the sun and the ATtiny85 processor packs a lot of Arduino compatible punch with very little power. The bulk of power consumption comes from turning the XBee on once and a while. The robotics club prototyped this circuit over the fall semester using a breadboard. 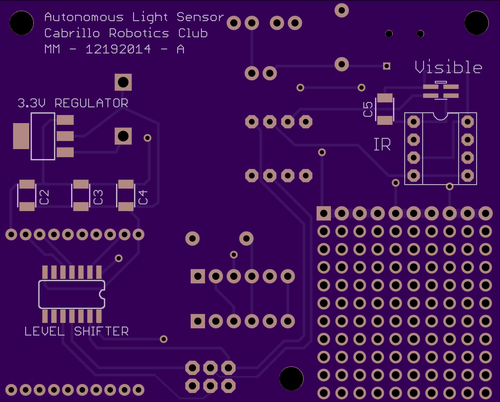 Now it's time for our first PCB! Anonymous signin from the web. I don't want to have to create and delete accounts for students because that's a lot of work and, since I'm using my own server, I don't have access to the CIS AD server. Use a popular protocol. Just because students login on the web doesn't mean that I should login from the web. I want to have my choice of clients so that I can pick one that's easy for me to manage. The ircd.conf file is fairly well documented. I setup the basic settings, naming my server and providing admin information. Because we'll be accessing this server over the web and because my webserver runs on the same machine I had to tweak the configuration somewhat. This will keep random lurkers out because I can give my students the password in class. 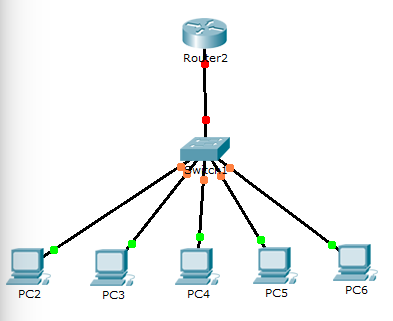 A determined person could watch my class or slides for the password but that would take more than a port scanner. If need be I can password protect the web interface. Now we need a web client. There happens to be a really nice and attractive one called KiwiIRC. It hasn't made it into Ubuntu yet but I hope it will someday. It's a very elegant program written in node.js. I read the installation instructions, but they need to be amended if you intend to run securely as a daemon. 2. Create a user for kiwi. 3. Become kiwiuser and follow the installation instructions. 4. Make it an always thing. Until they throw upstart overboard we need to add a script to /etc/init. Notice you can specify what channel to login to by default. Assuming you haven't put your users in the web jail you can use that to make widgets chat-room specific. That's what I want. Of course, as soon as you find a use for a board you figure out what's wrong with it. The candle controller is going to be used on my Burning Man project this year but needs to fit into a smaller tube. So a quick re-layout and ta-da. The narrow board. I never tested XBee on the first candle. I really hope it works. This programming assignment, Six Degrees of Bacon, by Steve Hodges has inspired me for the last two weeks. So on my first day off (yes, really) I have forgone food and a shower to make this homage. My prototype digital candle looked really good. The prototype used a separate power board wired to the Teensy3.0. That was cost effective but cost a lot of labor and delicate soldering to complete. 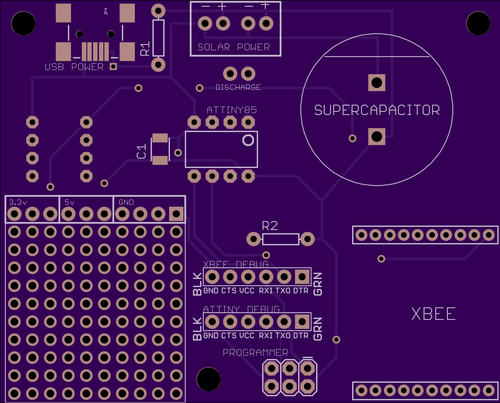 This new board swallows the Teensy and incorporates the power supply. Better still it has a slot to swallow an XBee. That means this board will be able to communicate with the outside world. I'm not sure what I'm going to do with that just yet. I'll think of something. Let me take a moment to explain #3. 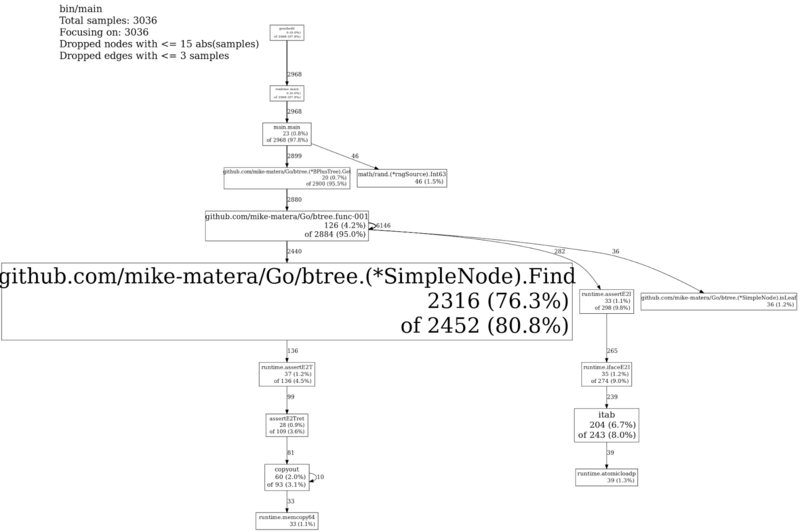 The benchmarking engine in Go works by calling your code with an iteration count. It times your code and then divides the time by the count to determine the number of nanoseconds per iteration. It starts with a small iteration count and increases the value until the sample is statistically valid. This has a poor property for comparing b-trees: The more elements in the tree the slower most operations will proceed. I can't control the iteration counts, instead I pre-filled the trees with 4 million elements. Why 4 million elements? Because inserting another million elements is not likely to change depth of the tree. 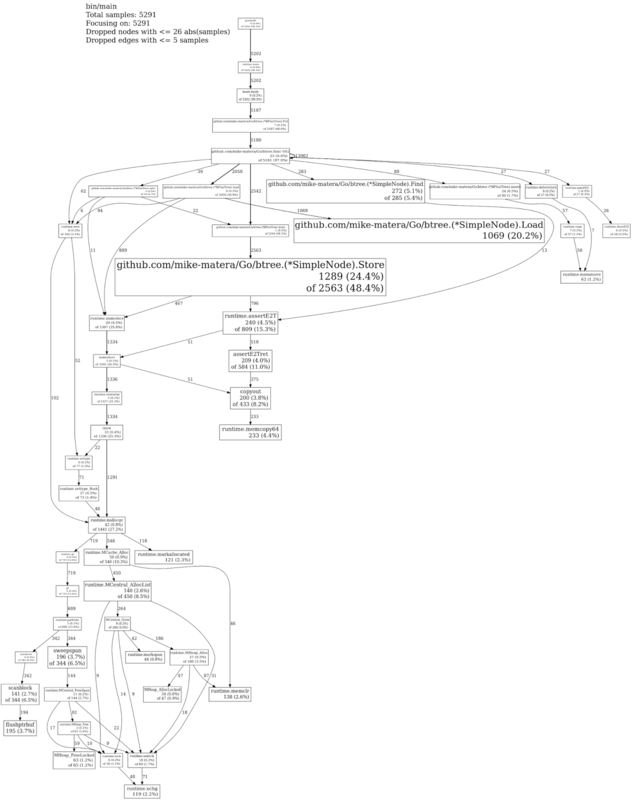 There's clearly a severe penalty for the Load() and Store() operations making my implementation an order of magnitude slower for operations that alter the tree. The good news is that my fetch implementation is somewhat faster. Since the expected mix of operations on a b-tree heavily favors lookups I believe that this offsets my poor update performance somewhat. In this case "bin/main" is the name of my executable. Much more information on how to use Go's pprof can be found here. The first command you're likely to use is the "top" command which shows you your top 10 CPU users. You can see that the top CPU hogs were Store() and Load(). The right most percentage is the percent of samples where those functions were on the call stack. A whopping 68.6% of the time. The 'web' command creates a nice SVG image of the result. Below are the results of the loop above and a similar one that fetches values.